Sueno Shredded Rubber Pillow Review and August/September Giveaway! Home > Blog > Sueno Shredded Rubber Pillow Review and August/September Giveaway! We know that pillow preference is unique to each individual and their sleeping style. The Sueno Shredded Rubber Pillow is a top seller at The Natural Sleep Store because of its comfort and versatility. It’s made with natural latex shredded into small pieces inside an organic cotton casing. This pillow will hold its loft—it won’t flatten out overnight so you won’t be constantly fluffing it. It’s also moldable! Rearrange the “shred” to give support to your neck and head. 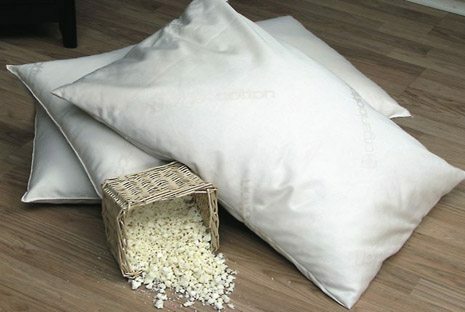 Some shredded rubber pillows can feel a bit lumpy because you can feel the individual pieces inside, however, this pillow has an outer organic cotton envelope case that cushions the shredded rubber pieces so that it feels smooth. The Sueno Shredded Rubber Pillow is easily one of our favorites! With all this pillow has going for it, it just might be the cure for insomnia! This month register to win a Sueno Shredded Rubber Pillow. Choose your size, worth $90-$110! No purchase necessary to win. This giveaway is now closed. The winner was Larry T. of Roaring River, NC. Congrats!